I move on to another book series. Last week, the last Percy Jackson book came out. About a year ago the fourth one came out, and a week before that I read the three first books in the series for the first time because a bunch of my friends were hyping up the book. I ended up not reading the fourth book intil July, and since I don't remember a lot of the plot from the previous books I've decided to reread the books before I read the last one. I only have the first one, Percy Jackson and the Lightning Thief, and the fourth one, Percy Jackson and the Battle Of The Labyrinth, so I borrowed Percy Jackson and the Sea of Monsters from one of my nerd friends, and now I'm all set until I want to read the third book. Maybe I'll read that in Swedish. I borrowed it from my library last year, and the translations aren't that bad with these books. If you know the basic plot of the Percy Jackson series, you know why I want to read these books when we talk about Greek mythology in my Swedish class. 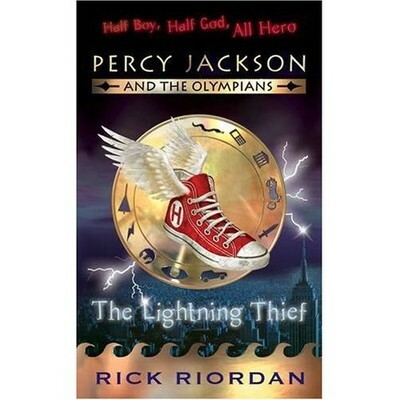 I really loved the portrayal of the Greek gods when I first read the books, and I'm loving it again. As for the hitchhiker, I finished Mostly Harmless the day before yesterday. Towel Day is a week away. Is anyone else gonna have a towel with them? "These numbers round the edge mark the hours. In the little window on the right it says THU, which means Thursday, and the number is 14, which means it's the fourteenth day of the month of MAY which is what it says in this window over here." - From Mostly Harmless (Douglas Adams), Chapter 15. Yesterday, on May 14th, I read that. It was Thursday. When I started my school in August last year, I met a few friends who liked The Hitchhiker's Series by Douglas Adams. I read the books many years ago, and I didn't remember much of it, so I decided to reread the series. My only problem was that I seemed to have misplaced my 5 in 1 paperback. It was not fun to realize. I decided to borrow it from my school library in December, but I didn't get around to reading it and had to return it before the Christmas break. So when I found a set with all the five books for a resonable price in February, I decided to buy it, with a goal of rereading all the books before Towel Day (May 25th). At the moment I'm on book four, So Long, And Thanks For All The Fish, and I'm almost finished. It doesn't, like The Restaurant At The End Of The Universe and Life, The Universe And Everything, have the same appeal as The Hitchhiker's Guide To The Galaxy, but I think I like this one more than book two and three just because of all the references to rain. I'm a real rain lover, so the fact that the first chapters are all about rain makes me really happy. Last week, I got a strong urge to go to the library. I will do so as soon as I finish the Hitchhiker's series. I'm not sure of what to borrow, but I think it would be wise to read some Swedish books now, since I'm going to Canada in August, and it probably won't be easy to find books in Swedish there. Also, I'm gonna participate in "214 dagar med Harry", where we reread the Harry Potter series, one book each month, starting from June through December. I will read the books in Swedish, since I haven't done so in a while, and even though I hate the translations with all my being, I feel like I should read them in Swedish. Plus, I can complain about the horrible translations here. Hah.